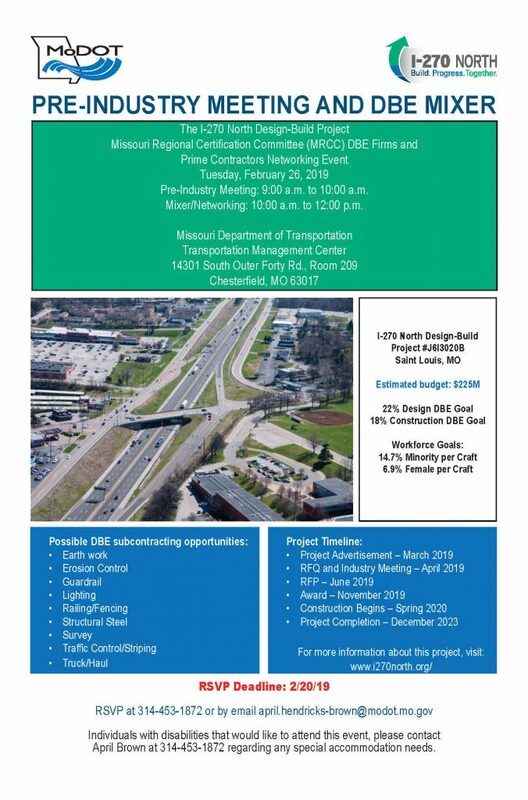 MoDOT will hold a Networking Event for the Missouri Regional Certification Committee, DBE Firms and Prime Contractors on Tuesday, February 26 concerning the I-270 North Design-Build Project #J6I3020B at the MoDOT Transportation Management Center. Pre-Industry Meeting is 9-10am. Mixer/Networking is 10am-noon. RSVP at (314) 453-1872 or email april.hendricks-brown@modot.mo.gov.